When I'm in a group debugging something or testing something, there's a tendency to start throwing out ideas. For example, "Hey, guys, I'm noticing that writing to the system is really slow." "It could be the disk is getting full." "Maybe there's a network problem - bad cable or bad port." "Perhaps we're saturating the network link." "Well, we could just be reaching a really really big index and searching it is slowing down." "What about memory? Are we swapping?" We have a lot of ideas, a lot of possibilities, a lot of guesses. Sometimes that's okay. Sometimes you really do need to generate a lot of ideas. Much of the time, though, we should probably do a little more thinking and a little less brainstorming. Sometimes with additional thought or analysis, we can identify one or two causes that are the most likely, and not end up wasting time chasing scenarios that are implausible as soon as you start to look at them. Take our example above. Several of the suggestions are network-based. A little thinking could say something like, "well, for each item written, we send X bytes over the network interfaces. At the fast Y rate, that's about 10KB/sec, which is well under the network speed. So at the slow rate we're almost certainly not saturating the network." We can use similar analysis to eliminate index size, disk use or memory as likely candidates based on the total amount of data in the system. All of a sudden, we're down to one or two likely candidates rather than five or six. Our debugging just got a lot more focused. Brainstorming is good when there are a lot of possibilities about what's wrong, when it's hard to eliminate any possibility, and when there is a large team that can analyze independently. In other cases, brainstorming might not be effective. When the team is small, time is tight, or you're in an interview, take those few extra minutes to think about each idea. Fewer is sometimes better. I spend s fair amount of time talking to people. Usually when I start a new gig, I'm there because some change is desired. There might be a problem, or maybe we want to build the next part of the big dream, or there's a process problem, or there's a need for growth. My first step when I come in is to shut up and listen. I talk to everyone who will spend time with me (donuts make good bribes). And I learn a lot, both about the thing being changed and about the people involved. Many people are looking forward to change. They want to solve the problem, or build something cool. And some people are really defensive. I walk away and I think to myself: Holy crow, this guy was defensive. But why? I actually don't know. I don't know this guy at all, so I don't know what's in his head. But I can guess. He's worried because it's an area where there might be a problem. Most of the time when I run across someone who is defensive about something, it's because they have enough fear about that thing to think there's a real problem. And it's often a fear based on some evidence. And THAT means it's useful. For example, I was working with a new team, and I had been brought in to analyze their content production process. So I sat down with all sorts of people who were involve, and I asked them about the process. I got a range of responses. The writers mostly thought it was fine; they liked the current process because it was easier. The editors hated it, since they were the ones who had to keep writers and drafts in sync, and they spent a lot of time copying content from one system or another. And then I ran into the graphics guy, and he was defensive. He thought everything was just fine thank you very much. And he didn't think any changes at all would be a good idea ever. It took some diving, but eventually I learned that the graphics guy was a pretty good layout person, and he was scared that any change in the process wouldn't let him tweak the layout. In other words, he was scared that a new process would expose a hole that already existed. And that was really good information to find out, because he was right. The new process we were considering didn't account for that at all. So when someone's defensive, dig a little deeper. There's likely to be a good reason why. When people ask what I do, I usually say, "I'm a software engineer". When I'm talking to someone who is not in software, it's a lot easier to say that than to explain that I'm a consulting VP of Engineering. It's also true. I work in software and I do work that - at least in the U.S. - is described as engineering. That is, it's technical work with the purpose of creating and shipping software. And for all the time we spend bickering between engineering groups or teams, we're all still software engineers. It's not about our name. It's not about are role. It's not about how we got here or what degree we hold. We're all here. We're all banding together with a purpose. We are all Spartacus. Just check it out. We do stuff! 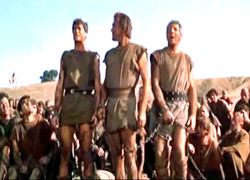 We're (software) Spartacus! But but but! This isn't real scrum! No, it's not. But it works for them. It's taken a planning process from a painful two days per sprint to a semi-painful 5 hours per sprint. The gain mostly comes from the team being so large - it's about 15 people. That's already about twice the size that many agile practitioners will advocate. Here's a hint: if you're already violating some of the rules of whatever process you're following, then don't get all stuffy about violating other parts of the rules. The goal of process is to do what works. If that means you work with a large team, okay. If that means the team trusts each other enough to take their plan, okay. In other words, be strict or don't. Either way, don't sweat it.